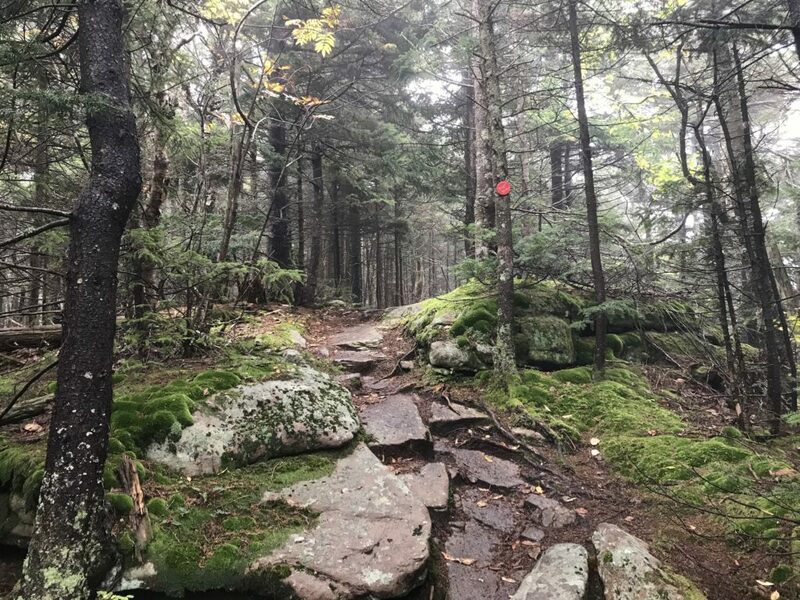 To access Cornell on a marked trail, you need to approach from either Wittenberg or Slide, two of the Catskills highest peaks and each one difficult enough on its own. Wittenberg is much more difficult than Slide, a withering epic that begins as it means to go on, with even the very beginning being a steep ascent to the sign-in register and, then after a 2.9 mile hike with an elevation gain of 2,000 feet, in the last mile before the summit there are three or four intimidating climbs up sheer rock faces. Hiking Cornell via Wittenberg from Woodland Valley is the third highest vertical climb in the Catskills. The climb to Slide, by comparison, is gentle: a gradual ascent with breathtaking views at its summit. Moreover, on Slide Mountain there is a historical tribute to John Burroughs, the Catskills naturalist and essayist. Affixed to the rock at the summit of Slide is a memorial plaque to Burroughs, strategically placed above the nook under which the old man slept overnight on his favorite mountain range. Slide is so utterly gorgeous, its been documented here at least three times, here, here and here. However, the beginning of the descent down Slide towards Cornell is very steep. 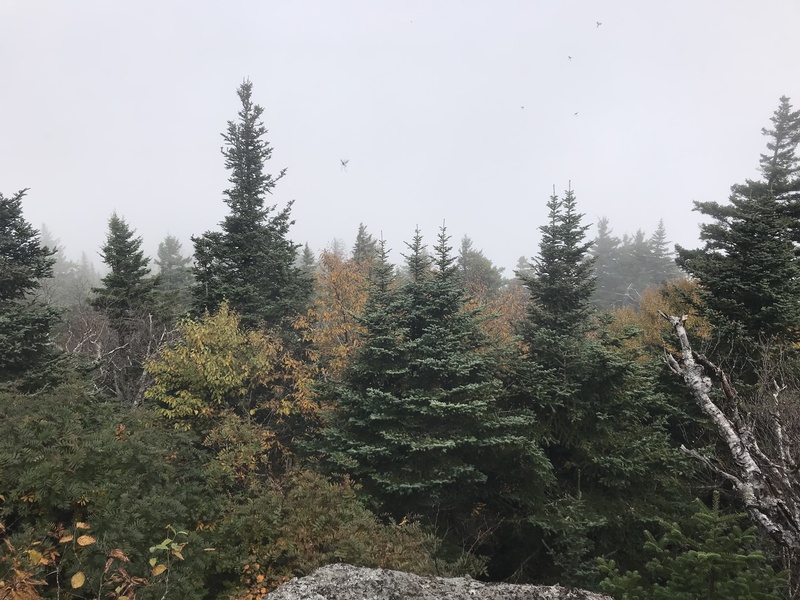 It’s more or less a sheer rock face covered in conifers, but it’s dizzying at times because you can see the mountains through the trees while you’re climbing down – terrible if you’re scared of heights. The approach to Cornell from Wittenberg, is easier and beautiful, though still rocky like the ascent to Wittenberg, but it’s necessary to conquer the ferocious-sounding “Cornell Crack” near the summit of Cornell, a rocky gash at least fifty feet high jutting into the sky. You can clamber your way up to the V (at the top middle of the image below) but once you get to that point a lot of upper body strength is needed to haul yourself over the top. It’s a fearsome, leg-trembling climb. Even if you’ve never heard the word vertigo, it should never be attempted alone. Fellow hikers mentioned that there is a way around the crack but it’s not obvious. 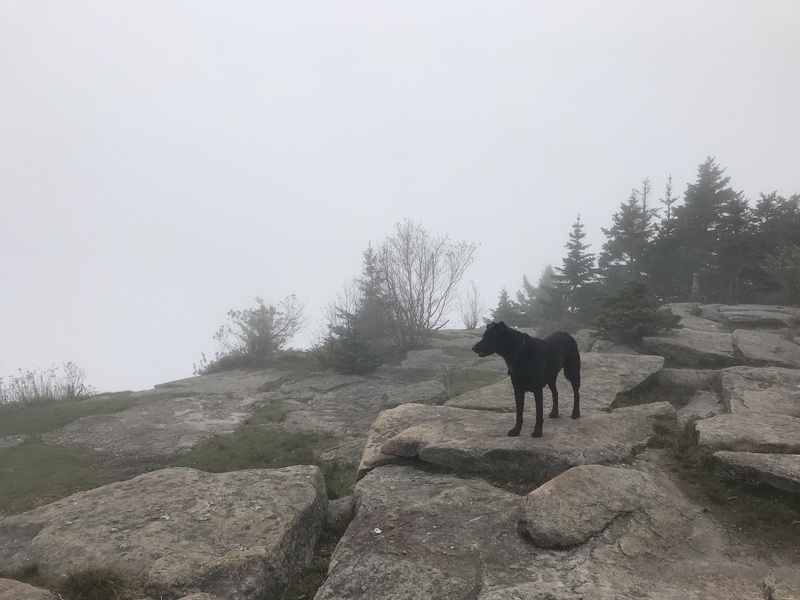 Unless your intrepid hiking dog can find a way around, it will have to be carried over the V part and that’s if he is well-behaved and doesn’t wriggle. 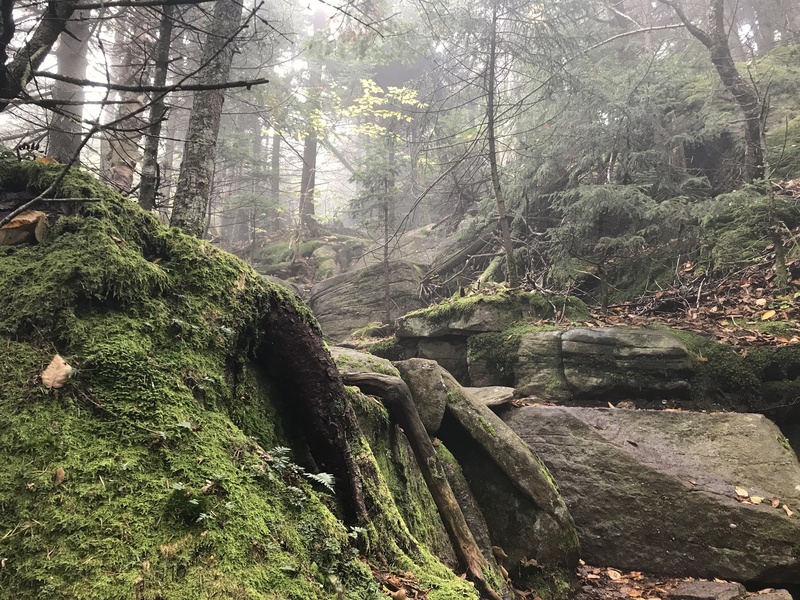 Both summits of both Wittenberg and Cornell were shrouded in mist, but hiking in the quietness of swirling fog is soothing and enigmatic, especially in the calming hemlock grove half way up Wittenberg. At both summits the trail is mossy and covered in colorful mushrooms, balsam fir and pine. Gorgeous but painful. Go to the NYNJ Trail Conference fora full set of maps for the Catskills hikes. To hike Cornell via Wittenberg, park in the parking lot in Woodland Valley. 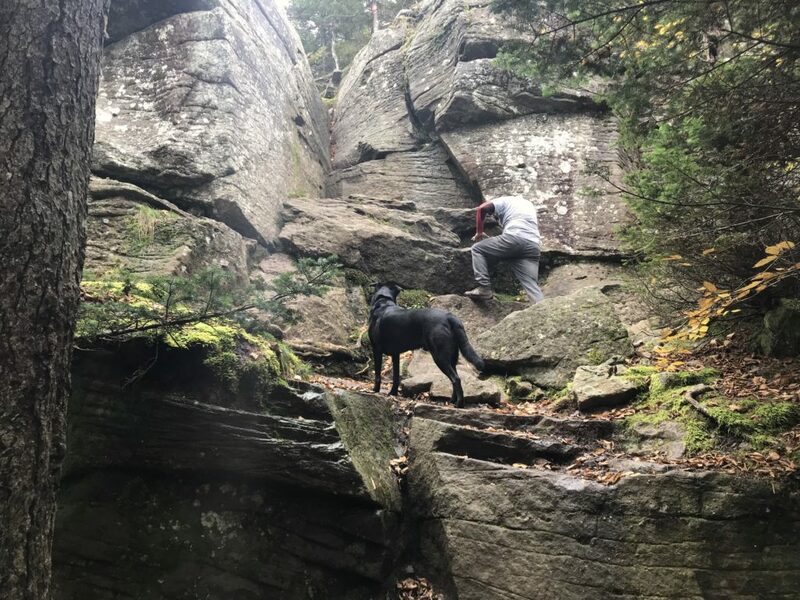 Be careful to take the red-blazed trail across the bridge over the Woodland Creek and NOT the yellow blazed trail that will take you in the opposite direction to Giant Ledge. Go to Catskill Mountaineer for a more detailed description.